"A real good and easy to make cookie." Empty the packages of cake mix into a large bowl. Add eggs and whipped topping, and mix until well blended. Roll the dough into walnut sized balls and roll the balls in confectioners' sugar. Place cookies 2 inches apart onto an ungreased baking sheet and flatten slightly to keep them from rolling off. 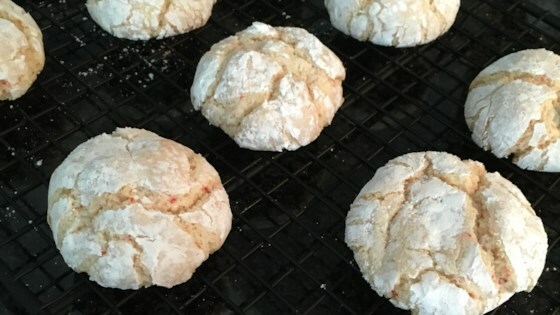 My family and I love these cookies, when making them your self they are very sticky but if you rub butter or margarine on your hands before rolling them in a ball you will have much better luck. The dough was so sticky..I don't think I would make it again..
Sp easy to make and so tasty! These cookies were soft and light. I would love to try with other flavors of cake mix! Tried this and love it! Did half recipe and added white chocolate chips....delish! Family loves these! I used Dream whip instead though! And made half the recipe!